Welcome to part 5 of 5 of our Divi mini series Creating Client Documentation to Empower your Clients and Save You Time. In this series, we’re branching out from a typical module or Divi design tutorial and will show you 5 ways you can create Client Documentation with the primary purposes of educating and empowering your clients and in the process, saving you time. In my previous post I covered the information and resources I send to my clients who are updating their sites but I didn’t want to leave my others to dry, so I now offer this to all of my clients once their site goes live. Most of this information are general and basic strategies that can be utilized by any client in any industry. My client resources page is a brand new experiment for my business but I’ve already started seeing the benefits for me and my clients. Let’s get into it! 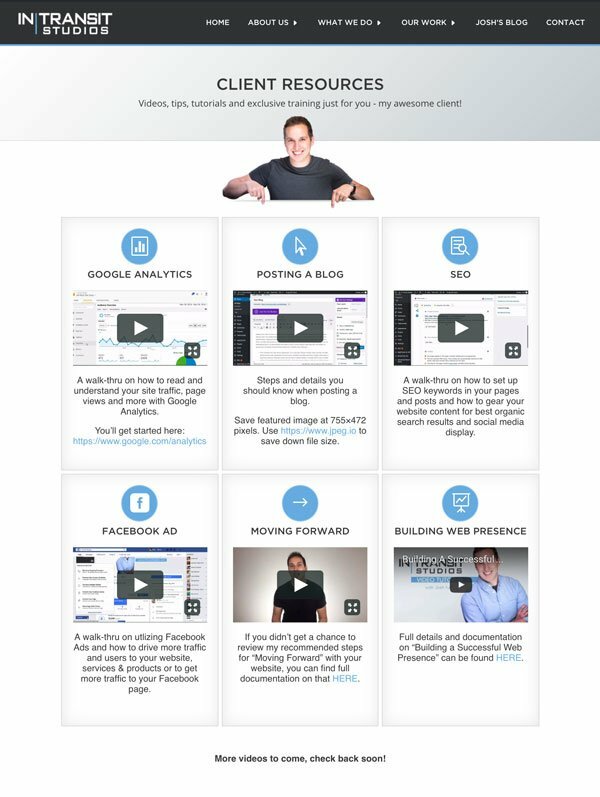 I’ve arranged my page using blurb modules with icons for each section to give my clients a visual along with a brief intro to the training videos. Most clients came to me wanting to know how to read and understand their Google Analytics, how to create Facebook ads and how they can drive people to their site, how to utilize basic SEO principles and more. So I decided to make tutorial videos and answer the top questions that were asked by my clients over the last year or so. Now, I send this link to the client and they have a resource that they can always refer back to and check in for recent updates/new tutorials. • You save time by creating a one-time video or article instead of answering questions over and over. • Your client will view you as an expert in your field making you more valuable than you know. • You’ll gain trust from clients by offering them free tactics, strategies and information that benefits their business. • You have a centralized place that you can update and put all most relevant strategies and tactics to help your clients. With a resources page that gets updated and added on to frequently, the client can have a source to always refer back to for timely, accurate tutorials and information. Instead of having to look for a new provider or consultant to find out some basics on growing their web presence, they can find that information in with you, someone they just worked with and more importantly, already trust. My resources page is rather new and currently only has 6 videos that, as mentioned above, stem from the most frequent questions I got from clients. But eventually I’ll be adding more videos and links to blogs, tips and tricks that’ll benefit my clients even more. I encourage you as we go through this to think about what you can offer your clients and what resources they may already be asking you about. I try to make my site as personalized and engaging as possible for all my clients. One way I’ve achieved this is to put pictures of me if possible next to information I’m giving in hopes to make it feel more personal since, after all, it is coming from me. Side note: you may not like seeing yourself on your website and you may take it as being vain, but clients love it. I don’t meet all of my clients in person so I’ve found this has been a great way for clients to feel more comfortable when they “see” who they’re working with. Most all clients want to know how much traffic their site is getting, what people are doing on their site, where they’re coming from, etc. Now there are numerous Google Analytics tools, plugins and generic reporting platforms but there’s nothing like just being able to look at your site stats in detail through Google Analytics. I put together a quick video that highlights the main areas that clients want to see. Those include Page Views, User Behavior, Audience Location, Site Referrals, etc. I took the most popular questions that my clients wanted to know and addressed them all in a generic tutorial video that they can follow and refer back to. I cover this information specifically and in more detail as mentioned in my previous post with a custom dashboard, but I’ve found that some of clients (technically inclined ones) began to start blogging and creating posts on their own. So I felt a basic walk through video very useful. In the video I cover posting a blog using the WordPress text editor, using a featured image along with some other basic details. The featured image is an important area for clients to understand as some were putting in very vertically long images and not understanding why they were so big. Basic training on posting blogs that a client can refer back to will be very useful for you in not only helping your client, but saving you time. I’m sure I’m not alone in the fact that most clients automatically think that I’m an expert in SEO. Well I’m certainly not, but I’ve learned some good practices that can be applied to any site in virtually any industry. And that’s what I go over in my SEO basics tutorial video. I utilize SEO YOAST and provide my client the basics on optimizing their posts for organic SEO. Though creating an ad will vary with each client on budget, industry, reach, etc – the general practices and strategies are similar. Incase I have any clients who didn’t take the time to review my “Moving Forward” page which is covered in Part 3 of this series, I give them the option here. This is a win win for me as I’m able to update both of these pages and clients can constantly refer back to them without having to reach out to me directly. Lastly, I currently give them a link to a video that’s based off a presentation I did about building a successful web presence. This is all basic, general information that again can be used by clients at any size and in any industry. So, what resources do you think your clients could benefit from after their site goes live? I’d encourage you to give them a resource page that they can refer back to which will not only help them, but will do wonders for you. Well I hope our series Creating Client Documentation to Empower your Clients and Save You Time has benefitted and inspired you to create your own! Again, client documentation is all about empowering and educating your client and in turn saving you time! This was a fantastic series. Thanks so much. Thanks, Alain! Appreciate your feedback here and your input in the group! josh, thanks so much for your good posts. is it possible to view these videos on your resources page or are they only accessible to your clients? I keep that page off my main menu currently since it’s for clients but I’m happy to share it with you and the Divi community! Thank u Josh. So appreciate your kind help. Josh’s posts were very helpful and easy to follow. They really helped me to crystallize my thinking on my whole business approach, not just the website stuff. I thought the “Actionday Planner” was a great mix of Old School and new tech thinking. Keep it coming. Great to hear, Donald! Really appreciate your feedback and for taking the time to check out some of my other posts. I’ll do my best to keep it coming! Josh, what an insightful idea. I love the way you think of the client, then incorporate idea to bring the client back for more resources. Thanks. Josh, brilliant series, I have learned a lot! Quick question, do you have the ‘Client Resources’ page on your website, or do you put it on clients’ websites, and why do you do it that way? Thanks, Terry! Right now, I just have it on my site. I do offer some resources and training links for clients who update their site in their custom WordPress dashboard (part 4 of this series) but I wanted to keep the actual client resources page on my site so clients would continually check back. That way they’re on my site and they may explore services, blogs, etc. Thanks Arno! Appreciate the feedback. Just Excellent! That’s all I have to say!! Very useful tips, I really enjoyed the series! Great to hear, Nahuai. Appreciate your feedback! For some very useful insights! I will looking into the possibility of providing a similar service to our clients. Great to hear, Shane! Thanks for the feedback! This is part 5 of the series, how can navigate to other parts. I guess I missed 2nd, 3rd and 4th. Just a suggestion, for any blog with multiple parts, one must provide quick link to navigate to other parts as well. Anyways, I guess I need to look for other parts manually. The other posts are simply preceding this one. So if you look at the date, just go to the four previous days in our archive and they’ll be there. Eventually we’ll have a little landing pages set up for all of our miniseries to make navigating to them all much easier. Do you find it more useful to place the resources on your page or on theirs? Thanks Chad! I put it on my site which has numerous benefits. It drives more traffic to my site and clients may poke around to see recent work, new services, blogs, etc. Seems to be working out well so far! The video isn’t available. Could you pls look over that?